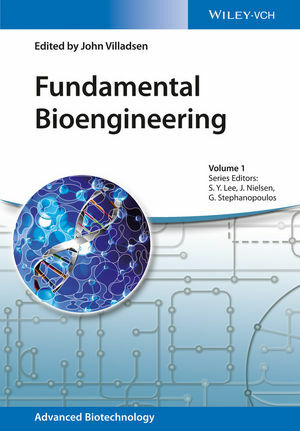 A thorough introduction to the basics of bioengineering, with a focus on applications in the emerging "white" biotechnology industry. As such, this latest volume in the "Advanced Biotechnology" series covers the principles for the design and analysis of industrial bioprocesses as well as the design of bioremediation systems, and several biomedical applications. No fewer than seven chapters introduce stoichiometry, kinetics, thermodynamics and the design of ideal and real bioreactors, illustrated by more than 50 practical examples. Further chapters deal with the tools that enable an understanding of the behavior of cell cultures and enzymatically catalyzed reactions, while others discuss the analysis of cultures at the level of the cell, as well as structural frameworks for the successful scale-up of bioreactions. In addition, a short survey of downstream processing options and the control of bioreactions is given. With contributions from leading experts in industry and academia, this is a comprehensive source of information peer-reviewed by experts in the field. John Villadsen is Professor in the Department of Chemical and Biochemical Engineering at the Technical University of Denmark (DTU) in Lyngby. In his early career he worked at the Danish spray drier company NIRO Atomizer in Sao Paulo (Brasil), as Professor of Chemical Engineering at the University of Houston, Texas (USA) and headed the Danish Center for Bioprocess Engineering at DTU 1985 -2001. Since 1985 he focused on the commercial use of industrially relevant microorganisms, specifically in the field of microbial physiology applied to lactic bacteria, yeast and filamentous fungi and he helped to develop novel routes for the production of bulk chemicals by fermentation. For many years he has been consultant to Bio-industrial companies in Europe and in the USA. Among his many awards is "The Novozymes prize for Bioengineering research" instituted in 2015 in his name. Sang Yup Lee is Distinguished Professor at the Department of Chemical and Biomolecular Engineering at the Korea Advanced Institute of Science and Technology (KAIST). He is currently the Director of the Center for Systems and Synthetic Biotechnology, Director of the BioProcess Engineering Research Center, and Director of the Bioinformatics Research Center. He has published more than 500 journal papers, 64 books and book chapters, and more than 580 patents (either registered or applied). He received numerous awards, including the National Order of Merit, the Merck Metabolic Engineering Award, the ACS Marvin Johnson Award, Charles Thom Award, Amgen Biochemical Engineering Award, Elmer Gaden Award, POSCO TJ Park Prize, and HoAm Prize. He currently is Fellow of American Association for the Advancement of Science, the American Academy of Microbiology, American Institute of Chemical Engineers, Society for Industrial Microbiology and Biotechnology, American Institute of Medical and Biological Engineering, the World Academy of Science, the Korean Academy of Science and Technology, and the National Academy of Engineering of Korea. He is also Foreign Member of National Academy of Engineering USA. He is currently honorary professor of the University of Queensland (Australia), honorary professor of the Chinese Academy of Sciences, honorary professor of Wuhan University (China), honorary professor of Hubei University of Technology (China), honorary professor of Beijing University of Chemical Technology (China), and advisory professor of the Shanghai Jiaotong University (China). Lee is the Editor-in-Chief of the Biotechnology Journal and Associate Editor and board member of numerous other journals. Lee is currently serving as a member of Presidential Advisory Committee on Science and Technology (Korea). Jens Nielsen is Professor and Director to Chalmers University of Technology (Sweden) since 2008. He obtained an MSc degree in Chemical Engineering and a PhD degree (1989) in Biochemical Engineering from the Technical University of Denmark (DTU) and after that established his independent research group and was appointed full Professor there in 1998. He was Fulbright visiting professor at MIT in 1995-1996. At DTU, he founded and directed the Center for Microbial Biotechnology. Jens Nielsen has published more than 350 research papers, co-authored more than 40 books and he is inventor of more than 50 patents. He has founded several companies that have raised more than 20 million in venture capital. He has received numerous Danish and international awards and is member of the Academy of Technical Sciences (Denmark), the National Academy of Engineering (USA), the Royal Danish Academy of Science and Letters, the American Institute for Medical and Biological Engineering and the Royal Swedish Academy of Engineering Sciences. Professor Gregory Stephanopoulos is the W. H. Dow Professor of Chemical Engineering at the Massachusetts Institute of Technology (MIT, USA) and Director of the MIT Metabolic Engineering Laboratory. He is also Instructor of Bioengineering at Harvard Medical School (since 1997). He received his BS degree from the National Technical University of Athens and his PhD from the University of Minnesota (USA). He has co-authored approximately 400 research papers and 50 patents, along with the first textbook on Metabolic Engineering. He has been recognized by numerous awards from the American Institute of Chemical Engineers (AIChE) (Wilhelm, Walker and Founders awards), American Chemical Society (ACS), Society of industrial Microbiology (SIM), BIO (Washington Carver Award), the John Fritz Medal of the American Association of Engineering Societies, and others. In 2003 he was elected member of the National Academy of Engineering (USA) and in 2014 President of AIChE.